This armoire is the perfect storage solution for small bedrooms because it maximizes vertical space area that would otherwise not be used. Traditionally used to store clothing, it could also make a perfect storage area for a small television or for the ever-popular Nintendo/Playstation video game systems that our children are so addicted to. Whatever you decide to place in it, you will find this armoire is a useful addition to any home. Very simple and inexpensive to build (mostly plywood), this plan uses biscuit joinery. 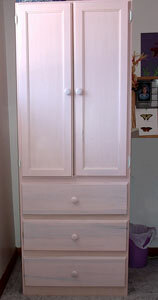 This armoire plan was designed to match the Mate�s Bed plans #03-202. Finish used for this project: Old Masters Penetrating Stain (custom tinted) covered with water-based Flecto Varathane Diamond Wood Finish, in a satin sheen. Photos, exploded views, detailed CAD drawings, optimize cutting diagrams, and a complete materials list.